The system is based on a Momentum pattern on Friday. The backtest has been conducted from 2009. The trades are opened every Friday at the appointed time. The trading robot can use up to 3 averagings. The EA does not use StopLoss. Timeframe – M15. Currency pair: EUR/USD. The EA can be backtested by bars or every tick. StartLots – starting lot size. This is the initial base lot to open a trade. It can be modified by EA basing on a market situation, but no more than twice. StartHour, StartMinute – deal opening time. StartMinute must be a multiple of 15 (0-15-30-45). The recommended time 06:00 for EET (Eastern European Time). StartDayOfWeek – trading day of the week (0-Sunday,1,2,3,4,5,6) when the EA trades. 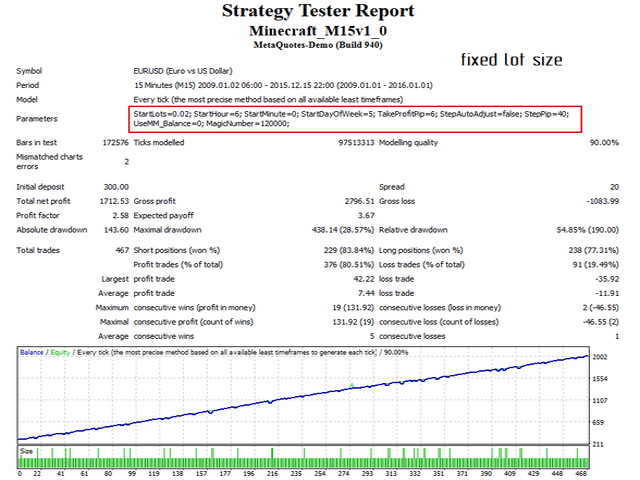 TakeProfitPip – profit target in pips (4 digits) from the entry price. StepAutoAdjust – auto-adjustment of the step of the averaging. 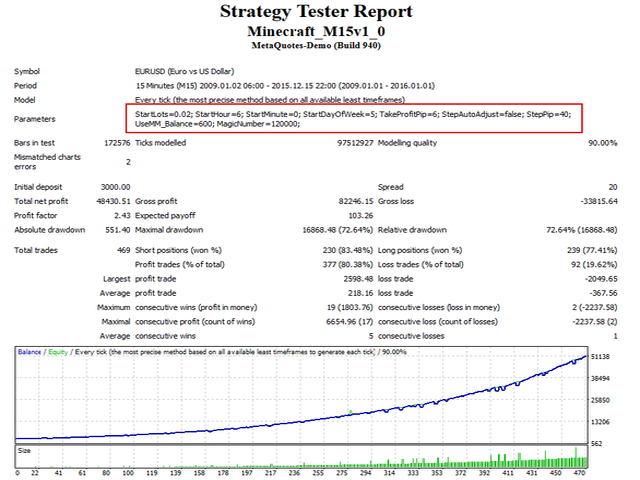 If StepAutoAdjust=true, then the step value will auto-adjusted by the EA based on the intraday and daily volatility. StepPip – step of averaging in pips (4 digits). UseMM_Balance – parameter in the deposit currency. If this option is set (i.e. different from 0), then the starting lot is calculated per each part of UseMM_Balance of deposit. If set to 0, then the starting lot is fixed and equals to StartLots. For example, if StartLots=0.1 and UseMM_Balance=300, when the balance is 300, the EA will open an order of 0.1 lot, and when the balance is 600 – 0.2 lot, when the balance is 900 – 0.3 lot, etc. This parameter is needed for reinvestment. The best things in life are FREE. Backtest looks promising! During this time it's getting good results! Nice EA, but as is common with the other EAs from Aleksey, you have to have a nice risk control. Very much works of this seller please . Products on averaging the best ! I wait for new qualitative advisers!!! - Introduced a new parameter - 'StartLots%Depo'. Initial lot value in %. When not zero the initial lot is calculated as % of the deposit, StartLots and UseMM_Balance parameters are ignored. If set to zero then EA will work with StartLots and UseMM_Balance. - Introduced a new parameter - 'SpreadFilterPip'. The spread filter in pips. If spread &gt; this value then signal will be ignored. - Introduced a new parameter - 'TrailingStopPip'. The trailing stop in pips. - Introduced a new parameter - 'Direction'. Select the direction of position opening: 0-Buy&Sell, 1-Buy only, 2-Sell only. - Introduced a new parameter - 'ID'. Unique identifier for the EA. Used for the best control of orders when running several of my EAs (such as Digger, Miracle) with same MagicNumber. - Introduced a new parameter - 'InformationPanel'. Show the information panel, false = hide.